It's that time of the month again - the beginning of June and the commencement of my May favorites. I have to say May has been a month of a few new acquisitions, but I have also found myself reaching back into my stash to retry some old forgotten products. Lately I have found that I love anything base related more than any other category, while I also have been finding some really great new releases in the lip product category. I just feel that no look is complete without a flawless-skinned base, so I have been mastering my foundation technique and finding the best types for my skin and the season. In terms of base this month I have been reaching for the Bobbi Brown Long Wear Even Finish Foundation (fewf, outta breath!) almost every day of the week. I find this so long lasting which is why I tend to wear it during my long weekdays. My only complaint comes with mornings when I hit the snooze button a few too many times, on which I will stay away from it as it requires a bit more blending than some of my lighter coverage bases. I have found one way to combat this though - I work some Clarins Instant Light Radiance Boosting Complexion Base with my fingers into my skin beforehand. This is a champagne colored base that comes out looking a bit like a foundation but leaves a glow, light coverage, and diffuses imperfections. Prepping my skin before going in with the foundation means much less product is needed, therefore not nearly as much blending. To set all of this I have been dusting my MAC Mineralize Skin Finish Natural in the shade Light around my t-zone - I always go back to using this powder - it's just so good! The final step to my base involves the Jouer Tint in Honeysuckle, which I have only had for about half the month, but since it's purchase I haven't put it down. This is a creamy stain for lips and cheeks, which I normally stay away from because often times they are sticky or greasy, but this one is neither of those. This is the perfect shimmer-free color that adds a life like flush to cheeks. Ahh, the fun part - lips! May has brought flowers, of course, but also a hefty dose of new lip products. On an everyday basis I have been dipping into my Dior Addict Fluidstick in Whisper Beige, a perfect neutral pigmented gloss that doesn't upset the balance of color when I go for a heavier eye look. For a lighter gloss with a sheer wash of color, I reach for the Yves Saint Laurent Gloss Volupte in 103 Opium Persan. This shade leans almost tangerine, which I find uplifting, but I would definitely pick up another shade as it is light and comfortable to wear on the lips with the lightest hint of shimmer. In terms of lipstick, I can't stop picking up the Chanel Rouge Coco Shine in the shade Flirt. It is the perfect peach shade for everyday; glossy with just the right amount of color and an extra dose of nourishment. In the eye department I have been going for cream shadow sticks more as of late. In the warmer months I tend to experience much more shadow slippage, even after applying a primer, so these formulas work the best. They do not budge - at all. 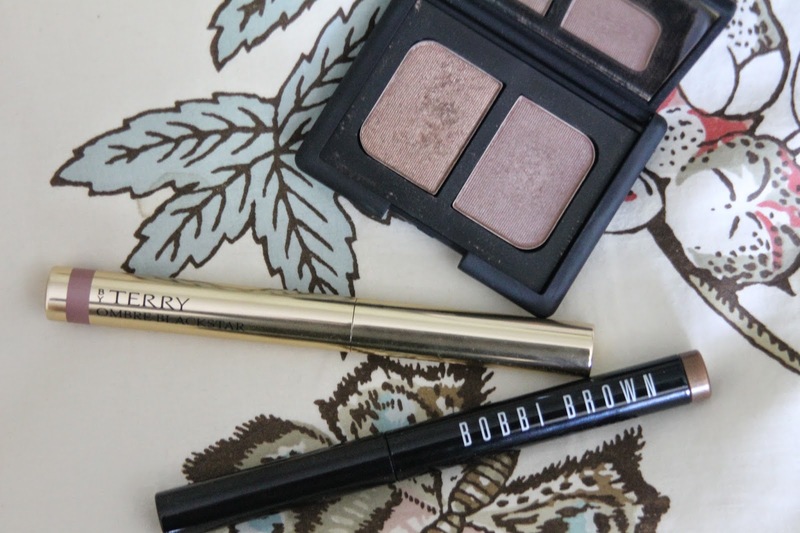 My favorites of the moment are Bobbi Brown Cream Shadow Stick in Golden Bronze (shade is self explanatory, I think...) and the ByTerry Ombre Blackstar in Misty Rock, a multitonal slate-purple. There are some exceptions for shadows that always last on my lids, no matter the season, and those tend to come from MAC and Nars. No surprise, right? Both brands are amazing, and while my MAC palette 'show and tell' will be saved for another post, I can tell you that my favorite from Nars is easily Kalahari, a duo that contains shades of warm gold and cocoa that can be worn alone, together, or in the crease in conjunction with one of the aforementioned cream shadow sticks. Did you have any experience with the products I mentioned, or do you have your own favorites that you could recommend me to try? It is the shade Misty Rock, I love it!